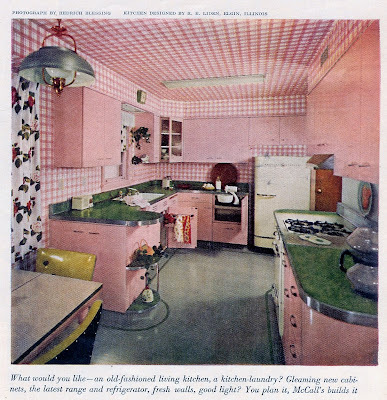 Kitchen and Residential Design: Reader question: What never goes out of style? Help! 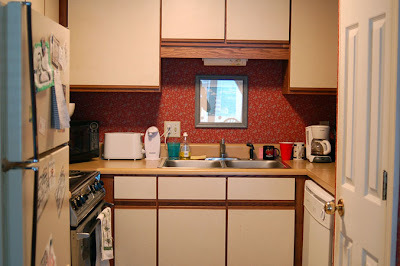 My husband and I are about to renovate our kitchen and I want to know what never goes out of style before we start spending money on this project. What style, in wood type and color never goes out of style? Hmmm. I hear this question a lot and I'm going to answer it by not answering it. At least not yet. 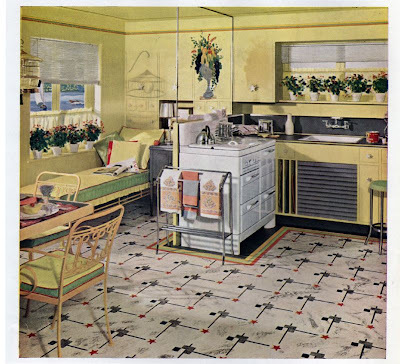 First, let's start by taking a stroll through some kitchen designs of the last 100 years. This is by no means an exhaustive survey of every kitchen style that's come and gone in that time period, but it will help me make my point so bear with me. Here's a kitchen from 1921. And here's what's being billed as a traditional style right now. As you can see, the words timeless and kitchen don't belong in the same sentence. Even the last photo, the "traditional" one, is pure trend. That layout, those appliances, that cabinetry... it's all very right now. 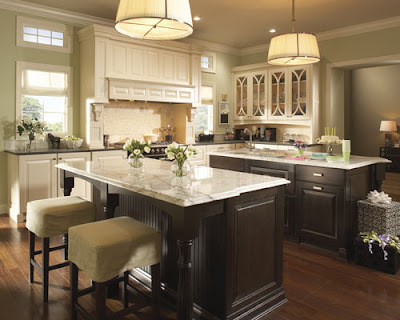 It may take a page from some past styles, but in the era it's invoking (1910-1920), a kitchen looked nothing like that. Contemporary kitchen design is new, regardless of the style of the room. The idea of a kitchen being the center of activity in a home was unheard of until 30 years ago. Pretend for a moment that it's 1955 and you're talking to your grandmother. Imagine her reaction to the news that you're planning to spend the equivalent of half your annual income on a kitchen renovation that will become the focal point of your home. She'd think you'd lost your mind and then she'd tell you to get out of the way so that she could get back to boiling the pot of diapers she'd been working on all morning. Kitchen designs change because our culture changes, and it's not just a function of trends in taste. Social changes, technological changes, economic changes, etc., evolve and reinforce each other over time. You'd hate an authentically period kitchen because you don't live the way people lived 20, 30, 40 or 50 years ago. How things look is inextricably linked to how things work. I say that there's no real answer to your question. Renovation and construction always look like the time when they were built or renovated. The minute you start swinging a hammer is the same moment that time stops and how you live right now gets preserved for all time. Or for as long as whatever you're building lasts. So even though I say that there's no answer to your question, here's some advice as you go about deciding how to spend your money. The first being that quality doesn't go out of style. Well-made cabinetry and appliances that are made to last will get you more years of use and satisfaction than cheap stuff will. In it for the long haul? Stay out of big box stores and get ready to spend some money. Second, I'd advise you to avoid specialty finishes on your cabinetry. That means anything with a glaze, a distressed paint or anything intended to give new cabinetry or furniture instant character. Character has to be earned and that's as true of your cabinetry and furniture as it is about your personality. Short cuts to character don't work. Third, avoid adding colors that are right now to things you can't change easily. A good case in point is the light blue and brown color palettes that are still all over the place. Getting light blue appliances, a finish color available from Dacor right now, might look good for now but five years from now you will hate them. If you love that blue and brown palette, get blue and brown throw rugs, not appliances. A blue throw rug costs $20 a blue fridge $3000 to $4000. You tell me, which would you rather replace in a couple of years? So the lesson here is to accessorize with trendy colors, don't build them in. Finally, do some research on where kitchen design has been and where the experts think it's headed. You cannot anticipate what's next with any degree of certainty, but you can take steps from getting yourself locked in the past too tightly. The idea that the kitchen is the center of a home in 2009 is not something that's going away any time soon. But this Old World style that can't go away fast enough is a recipe for heartache later. Where to turn for guidance you ask? 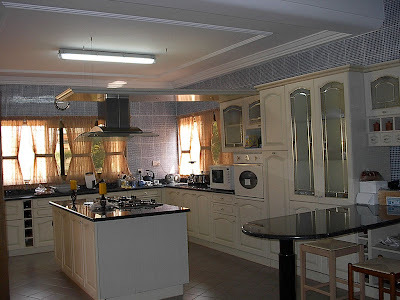 Hire a professional kitchen designer to help you realize your dream. Explain very clearly to him or her what you want to do and have this designer be standing in your home while you do this explaining. Think this through and have a detailed plan before you start writing checks and you'll be a lot happier in 10 years than you would be otherwise. Whatever you end up with, be sure that it reflects your life, your hopes, your needs and your wants. I loved this post. 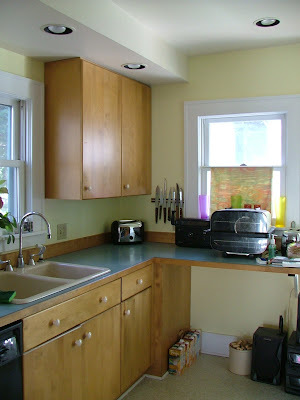 We are re-doing our kitchen now and I have been pondering this question -- or at least, the similar question, "what can I do that I won't be mad at myself for doing 10 years from now." The photos and your explanation really reinforced what I was already thinking of doing, even though I still really want a blue tile backsplash because I just love blue. Hey, thanks for the comment Erika. If you really want a blue backsplash, then by all means get a blue backsplash. Find yourself a nice majolica cobalt blue tile and go for it! But your right! a good basic kitchen design takes some thinking. It really has to fit YOUR needs. How true, how true!! I will say that my neutral kitchen that is 10 years old now still looks great to me. I did splurge on appliances and for that reason remain very happy with them. For some, my kitchen may be too plain but it has allowed me to make minor changes with art and rugs that give it a fresh snap. I LOVED the old photos. The 1970's photo reminded me of the house I grew up in. 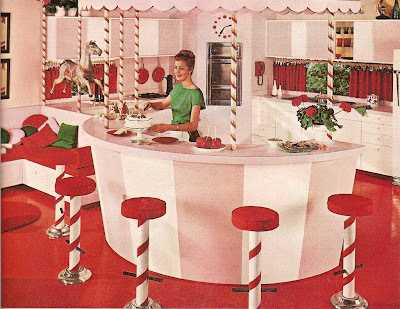 Thanks for the nostalgia (and also the reminder or why I still abhor some of the decor trends that stem back to the 70's)! I'm looking forward to the photos of your new kitchen M! How you guys do things in Europe is endlessly fascinating to me. Endlessly. Ming! There you are. you're not alone in your abhorrence of a lot of the stuff that came out of the '70s, the decade of shame. I see a lot of that stuff being revived and a little part of me dies every time I see a new use for harvest gold or macrame owls. I lived through that nonsense the first time and I'm in no great hurry to go back to it. I can understand young peoples' interest in it to a certain degree, but people of a certain age (like me) ought to know better. What a timely post! I am KILLING myself trying to come up with a kitchen design that will be timeless. Your examples illustrate important points - I don't think there is timeless, and you have to chose what you love. I LOVE the light fixtures in the last picture - any idea who makes them??? Thanks for the comment. Those light fixtures are by Vaughan lighting, Christopher Peacock uses them all the time. I know this because Gina at Willow Decor is a genius and she researches all of this stuff. Check out her blog! Ok, that was just fun. Fun!! Ah well - at least I didn't get stuck in "Hell's Kitchen - the 1961 North Pole Edition." OK, OK I'll admit it. I'm turning into a cranky oldster and shaking my fist at these damn kids today. But I speak the unspeakable --things like "no one looks good in hip hugger jeans." I perform a vital public service. Hah! I love the huge, wall-mounted sink in the 1931 kitchen. This things are still around, eBay's lousy with them. I wonder how practical they are. Ooooh, '61 AND '71 scared the living daylights out of us! Thanks! Welcome to my blog. Yours has some good stuff on it. I forget what spring looks like sometimes, thanks for the reminder! Joy and Janet, thanks for your comment! How did you find me? Your blog is a scream! Do you guys ever make fun of Jonathan Adler or am I the only one?! Hah! I loved this article. Is that a fainting couch or a chaise lounge chair in 1941? I guess that was the plan for togetherness back then. Have a place for dear hubby to lounge about as dinner was served by the happy homemaker. Notice the stainless steel is the only unifying material that stands the test of time and trends. 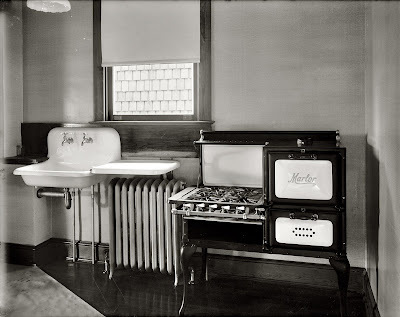 One of the 1940s kitchens I rejected had a kitchen with a playpen, an ironing board, a washing machine and a sewing machine --all within a step of one another. A work quadrangle whose time is long gone, thankfully. And yes, I think the chaise in the kitchen I did run was a place for the Lord of the manor to lounge while his dinner was being prepared. And yes, I did notice a lot of stainless from decade to decade as I was putting those images together. Chrome's another recurring theme. Thanks Lylah and welcome! Come back often and tell us stories of France and Arizona. I'll have to get some recipes from you while I'm at it. I loved this article because I used to own a 1928 dutch colonial in Shaker Heights, Ohio. As I got to know my neighbors, I got to visit kitchens that had been redone in each decade since. It frustrated me that any kitchen I do will be declared "dated" by visitors sometime not too far off. My neighbor's beautiful functional Eichler kitchen is in a sort Tuscan/modern hybrid, and amazing food comes out of it. I thought it was so perfect 10 years ago and was a tad jealous. 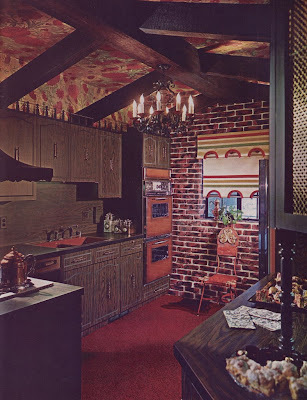 Recently I read some Eichler article condemning the Tuscan kitchens, extolling the modern sleek italian kitchens. Those are cool too, but they are no more essential Eichler than the Tuscans were. Being dated is inescapable. But a great kitchen, well laid out, from which I make a lot of great food. That's a kind of dated I'm prepared to live with. And, I really want to cook on gas again. Things aging and getting dated isn't necessarily bad. Great design remains great design. Always. That little fact of life works independently of the style of a room, a piece of furniture, or of a whole house. Does a room make life more efficient? Is it a welcoming backdrop to the joys and trials of every day life? The backdrop aspect is the most important yet most neglected if you ask me. A room should not be the star of the show. The people who are in the room should be. Thanks! I'd love to see photos of everything you've described. I still have my original 1911 kitchen sink, tub and lavatory. I curse them constantly but I'm in no hurry to get rid of them either. You can send me your photos any time. You can reach me through the contact tab at the top of the page. Cool! I will. I don't curse mine at all except the barely insulated oven in summertime. I have the opposite problem. I have an uninsulated bathroom. I live in a warm climate so it's only a problem for a month or so a year. Stepping into a 45-degree bathtub in a 45-degree bathroom on a 45-degree morning is the stuff of my nightmares. Paul. What an excellent article! I'm in the process of building a house and want to ensure my kitchen won't look outdated in 10 years. Your putting together pictures of what was in style from past decades drove home the point that hard as I try, I won't be able to do that. The best I can do is to stay away from the wild colors (and stainless appliances, which I see being out of style in a few years) and stick to the basics. Thanks! But even with your excellent article I still gotta choose what to do - tough - wish I had you here to do it for me. Thanks Bill, I've been beating this drum for years. 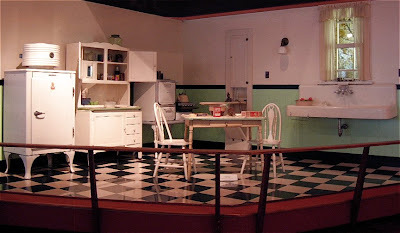 I WANT my kitchen to look dated- because I want a 1940s/1950s kitchen.